The Butler boys 4x800 meter relay team of, left to right, Gabe Warren, Kyle Wertz, Long Fa Lin, and Adam Gunkel won the event and qualified for Regional at the Division I Track and Field District meet at Piqua High School. 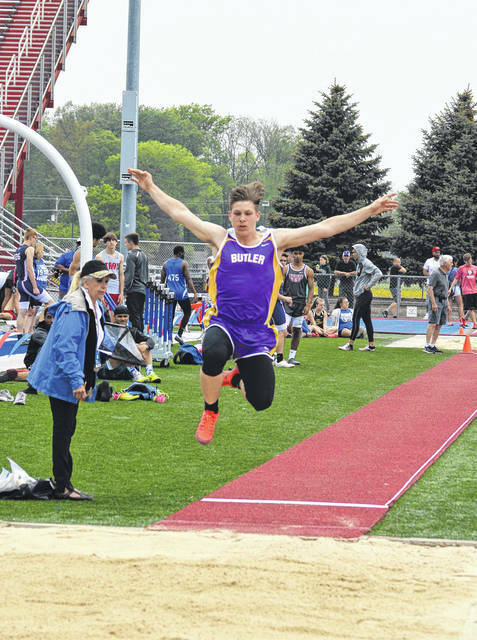 Daiton Sharp placed second in the long jump and qualified for Regional at the Division I Track and Field District meet at Piqua High School. The girls 4x800 relay team of Carly Cline, Elizabeth Kilgore, Victoria Theobald, and Abbie Schoenherr placed second and qualified for Regional at the Division I Track and Field District meet at Piqua High School. 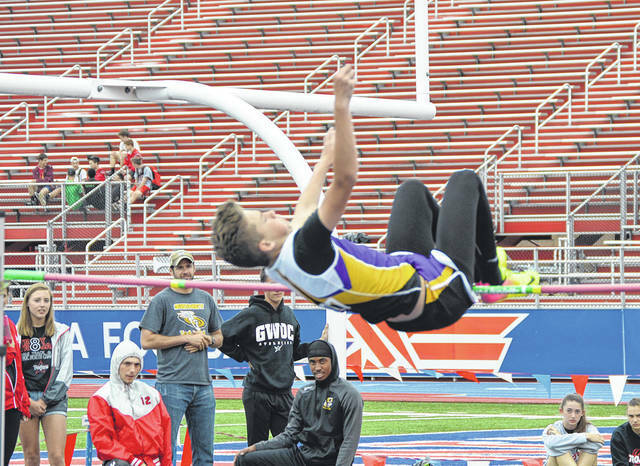 Logan Woods competed in the long jump at the Division I Track and Field District meet at Piqua High School. Tyree Fletcher competed in the high jump at the Division I Track and Field District meet at Piqua High School. 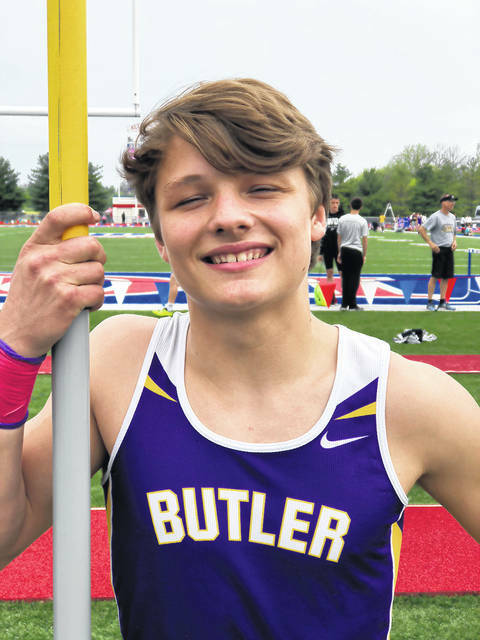 Dalton Shepler won the pole vault competition at the Division I Track and Field District meet at Piqua High School. 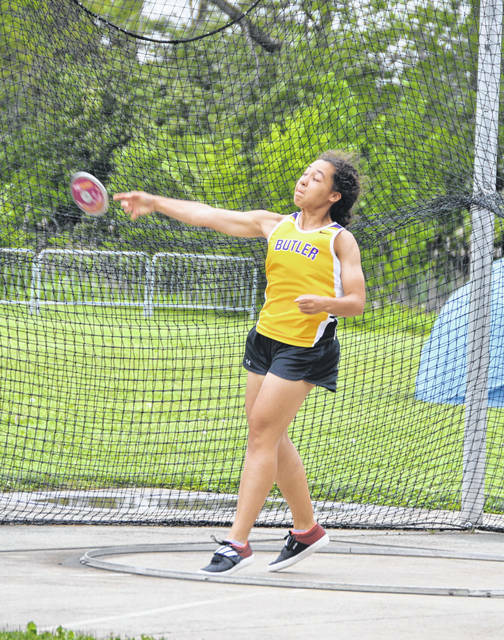 Alissa Spieles competed in the discus throw at the Division I Track and Field District meet at Piqua High School. 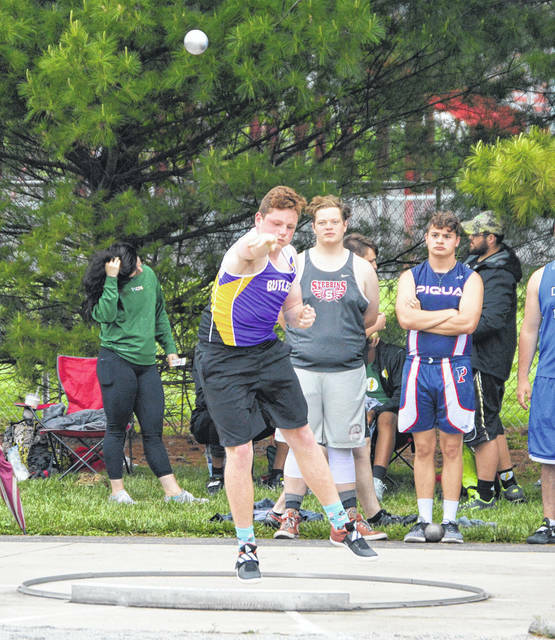 Troy Dixon competes in the shot put competition at the Division I Track and Field District meet at Piqua High School. 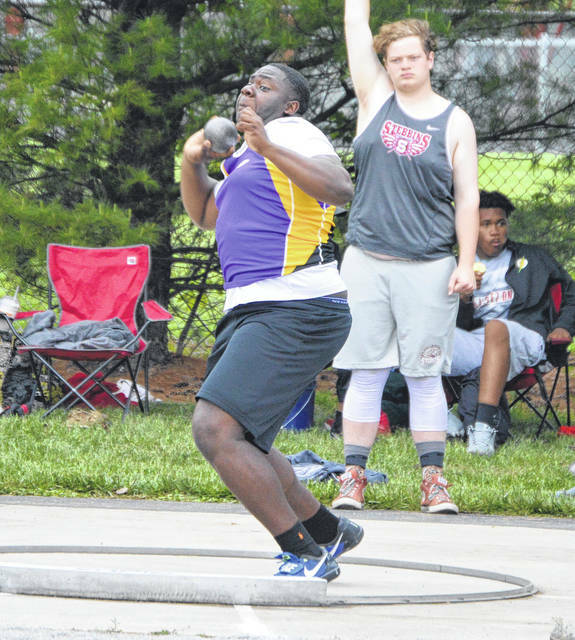 Charles Ellington competes in the shot put competition at the Division I Track and Field District meet at Piqua High School. 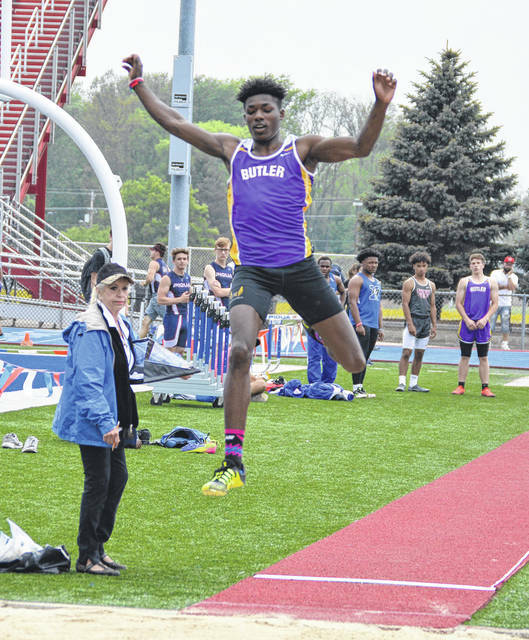 Tyree Fletcher qualified for Regional in the long jump competition at the Division I Track and Field District meet at Piqua High School. 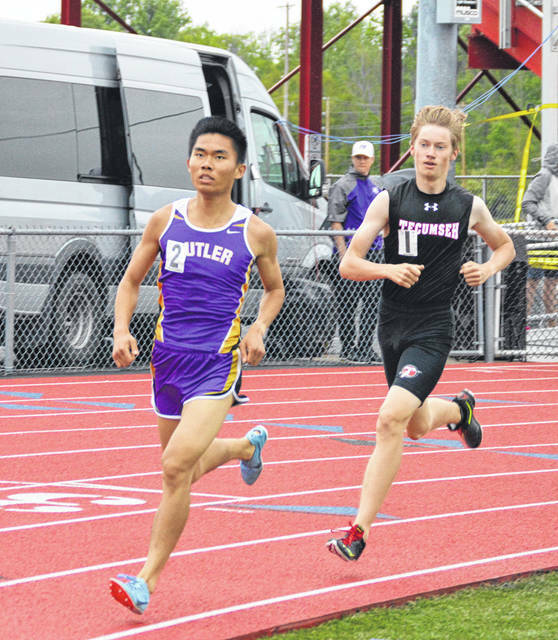 Long Fa Lin won both the 1600 meter and 3200 meter runs at the Division I Track and Field District meet at Piqua High School. 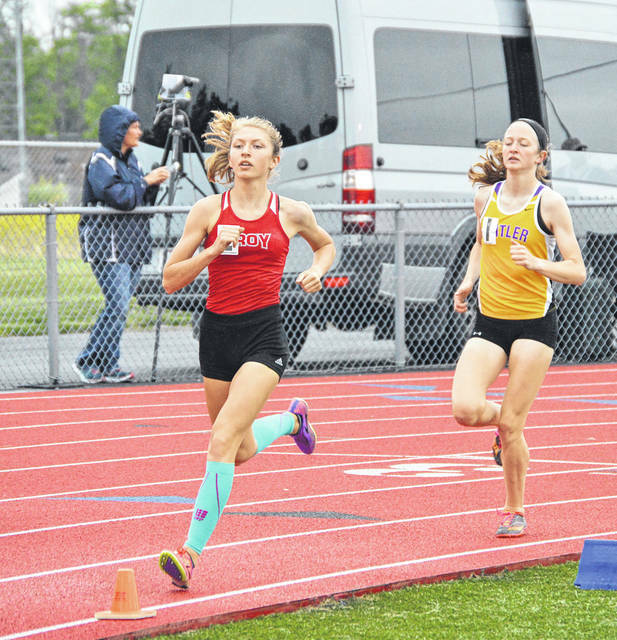 Abbie Schoenherr qualified for Regional in the 800 meter and 1600 meter run at the Division I Track and Field District meet at Piqua High School. Zach Ballard clears the bar in the high jump competition at the Division I Track and Field District meet at Piqua High School. Butler’s relay team of (left to right) Grace Marshall, Rachel Redmond, Shi’Ann Storer, and Nikeisha Harris qualified for Regional in both the 4x200 meter relay and the 4x100 meter relay. 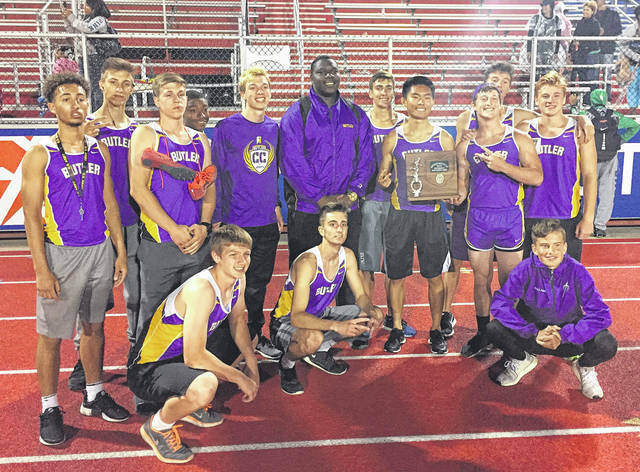 The Butler boys track team celebrated their overall second place finish at the Division I Track and Field District meet at Piqua High School. 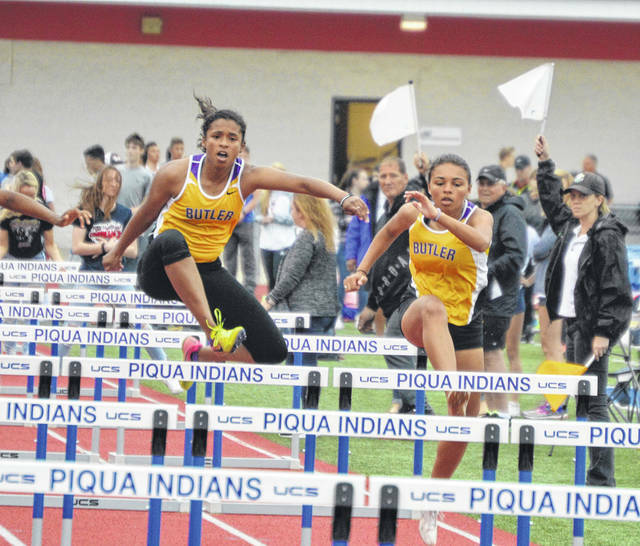 PIQUA — The Butler boys and girls track teams made a splash at the OHSAA Southwest District Track and Field meet at Piqua this week. 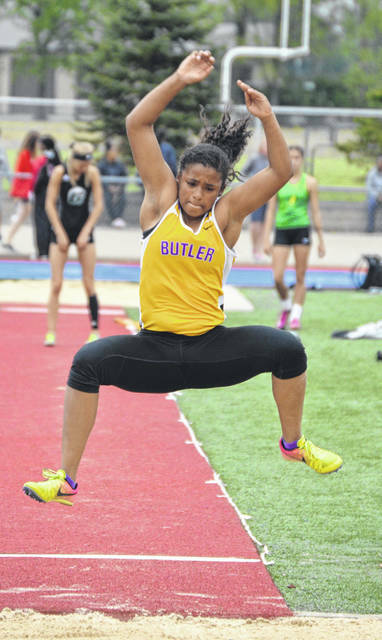 Butler’s boys finished as District Runners-up while the Lady Aviators were sixth overall. More importantly, both teams qualified for the Dayton Regional meet in seven events each by virtue of a top four finish. The boys 4×800 meter relay team of Kyle Wertz, Adam Gunkel, Gabe Warren, and Long Lin scored 10 points with a win in a time of 8:08.71. 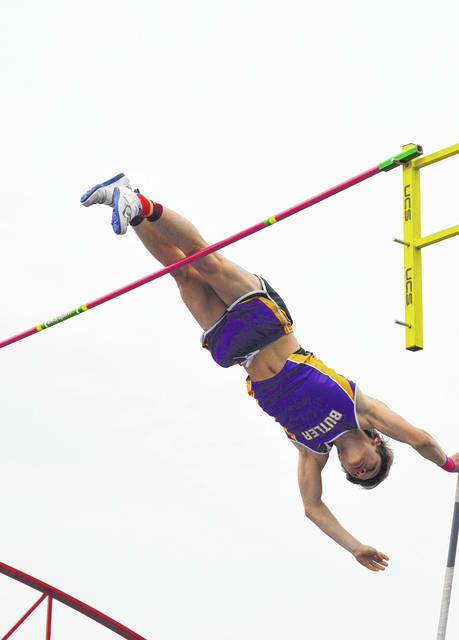 Also winning was Butler pole vaulter Dalton Shepler who cleared 13 feet, 8 inches. Lin also won two individual events. He ran 4:29.39 in the 1600 meter run and then came back with a 9:45.62 in the 3200 meter run for the sweep. Teammate Gabe Warren was second in the 3200 meter race in 9:46.91. Also qualifying for Regional were Daiton Sharp in the long jump. He placed second with a leap of 22-04.75. Troy Dixon also advanced in the discus throw with a third place finish at 137-00 feet. Adam Gunkel and Kyle Wertz both qualified for Regional in the 800 meter run. Gunkel placed third in 2:02.31 and Wertz was fourth, less than a half second behind Gunkel, in 2:02.71. 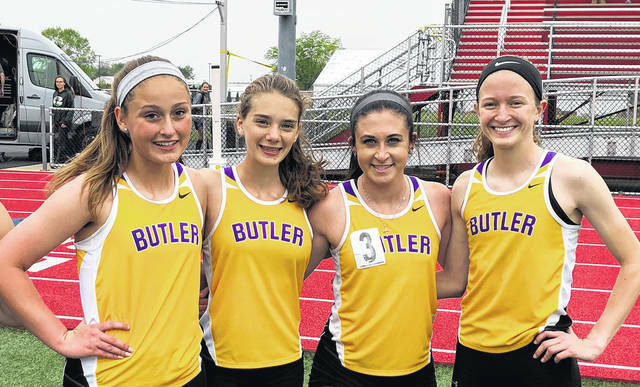 Butler’s girls 4×800 meter relay team also qualified by virtue of their second place finish. Carly Cline, Elizabeth Kilgore, Victoria Theobald, and Abbie Schoenherr ran a time of 10:22.20. Grace Marshall, Rachel Redmond, Shi’Ann Storer, and Nikeisha Harris combined to qualify in two relay events. In the 4×200 meter relay, the team ran in 1:50.36 for a fourth place finish and the 4×100 meter relay team placed third in 51.47. Tyree Fletcher also qualified in two events. 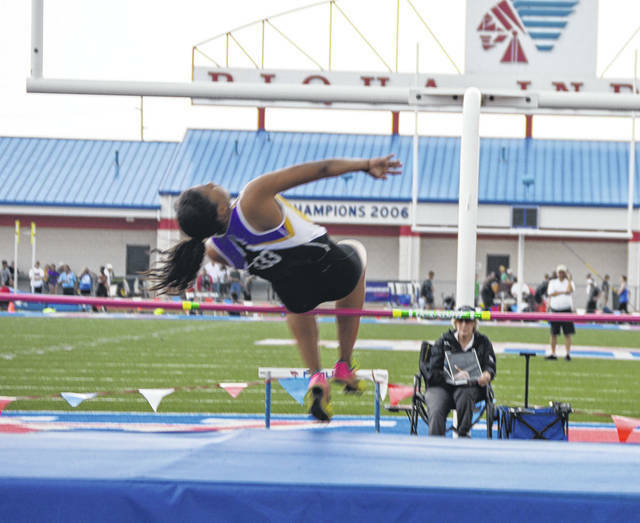 She placed third in the 300 meter hurdles in 49.61 seconds and fourth in the long jump at 16-01.50. Schoenherr also qualified in a pair of events. She was second in the 800 meter run in 2:23.52 and third in the 1600 meter run in 5:39.92. “This was a great meet for the team, and the coaches are extremely proud of the way the girls competed,” said coach Kyle Schoenherr. “Our 4×800, 4×200, and 4×100 relays seized the moment and ran great races. Add to that the individual efforts from Tyree and Abbie, and it puts us in seven events at the regional meet. Those qualifying for the Dayton Regional will begin competition on Wednesday at Wayne High School. Field events begin at 5 p.m. with running preliminaries starting at 6:30 p.m. The meet will continue on Friday with field events beginning at 5 p.m. and running finals starting at 6:30 p.m. 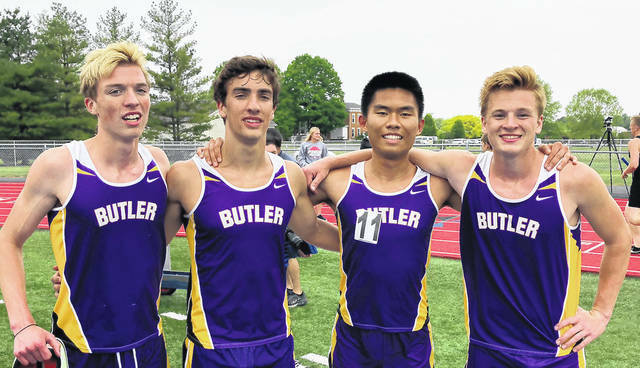 The Butler boys 4×800 meter relay team of, left to right, Gabe Warren, Kyle Wertz, Long Fa Lin, and Adam Gunkel won the event and qualified for Regional at the Division I Track and Field District meet at Piqua High School. The girls 4×800 relay team of Carly Cline, Elizabeth Kilgore, Victoria Theobald, and Abbie Schoenherr placed second and qualified for Regional at the Division I Track and Field District meet at Piqua High School. 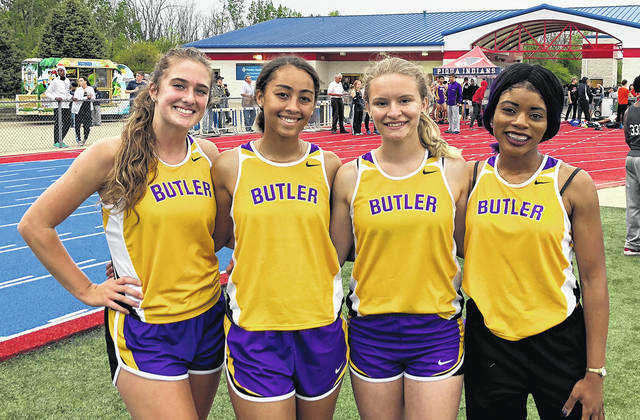 Butler’s relay team of (left to right) Grace Marshall, Rachel Redmond, Shi’Ann Storer, and Nikeisha Harris qualified for Regional in both the 4×200 meter relay and the 4×100 meter relay.